The National School Lunch Program — the federally assisted and state-administered program that provides free or reduced price meals to millions of children in school and after-school programs — should be expanded to serve low-income college students as a means of boosting their chances of earning a degree. That’s the key argument of a new proposal being presented this week at a national conference on housing and food insecurity among undergraduates. “Investing in college students by offering them the food assistance they need to do well in school has immense long-term potential,” states the proposal, developed by the Wisconsin Hope Lab, a policy and research organization at the University of Wisconsin that is devoted to issues that confront low-income students. “It will likely improve college attainment and reduce future dependency on the social safety net,” the proposal states. The proposal would cost an estimated $4 billion annually to provide food assistance to approximately 7 million Pell grant recipients, thereby increasing the number of participants by about one quarter of the 30.5 million young people who currently participate in the program. Sara Goldrick-Rab, author of the policy proposal and founding director of the Wisconsin Hope Lab, said while there are no concrete plans to make the proposal a reality, it represents an important first step in trying to garner support for the idea to make sure college students do not go hungry. The report cites previous work the Wisconsin HOPE Lab did in seeking to unearth the extent to which undergraduates experience hunger from day-to-day on campus. For instance, it cites figures from its 2015 “Hungry to Learn” study, which found that most students — 61 percent — experienced food insecurity at some point during the academic year. The proposal — which is being presented at the Wisconsin HOPE Lab’s #RealCollege conventing on Thursday and Friday at Milwaukee Area Technical College — frames the issue of campus hunger as one that can potentially have an adverse effect on college completion. “Insufficient attention to the nutritional needs of undergraduates could contribute to the inadequate production of college-educated labor,” the proposal states, citing research that shows 60 percent of all jobs require some form of post-secondary education but that there are not enough college educated individuals who are qualified to take those jobs. Further, the report cites the rising cost of college and laments that students from high-income families are six times more likely to graduate from college than those from low-income families. The proposal says there are issues with having students obtain assistance through the Supplemental Nutrition Assistance Program, or SNAP, because it requires students to work at least 20 hours per week, which can be difficult to manage with school. Among progressives, the proposal to expand the free and reduced lunch program to college students is so new that some — such as Generation Progress, a unit of the left-leaning Center for American Progress that focuses on issues that confront college students — declined to comment on it because staff there were unfamiliar with it. The proposal has drawn criticism from some quarters, including among organizations that support limits on government. “Through its ceaseless subsidization of higher education, the federal government has actually managed to make it much more costly,” Leef said, echoing research that has found expanding the Pell grant program has enabled colleges to charge more in tuition. “It would be far better for individual institutions to find out if any students are so needy that they require assistance and then provide it from their own funds or donations targeted for that purpose,” Leef said. The Wisconsin HOPE Lab’s proposal notes that some colleges are already taking steps to implement a school lunch-type program on their campus. However, the proposal maintains that more often it is faculty and staff members who report that they are taking it upon themselves to help students obtain food on an individual basis. 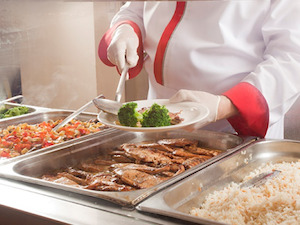 The proposal calls for a “gradual rollout” of the expansion of the national school lunch program on campus and argues that the effort should be “rigorously evaluated” to see if it actually makes a difference on student nutrition and academic progress. Jamaal Abdul-Alim can be reached at dcwriter360@yahoo.com or follow him on Twitter @dcwriter360.